I am very grateful for the perceptive insights into this card, given in this Guest Post, by Holly Marie Colino. This does not mean to castigate your opposition but to expose yourself with purpose and bravery. What does personal courage mean to you? Personal courage is what it sounds, personal. That is you standing in a confident and sure footed position for yourself with courage and purpose. The Seven of Wands has you standing in your truth in order to sustain your divine values, boundaries, worth and beliefs for causes that are personal or for the greater good of humanity in which you stand. This represents a brave individual with willingness to take the undesired position, as a lone entity against all opposition, for an honorable cause. Alternatively this can mean that the opposition you face is within in you. 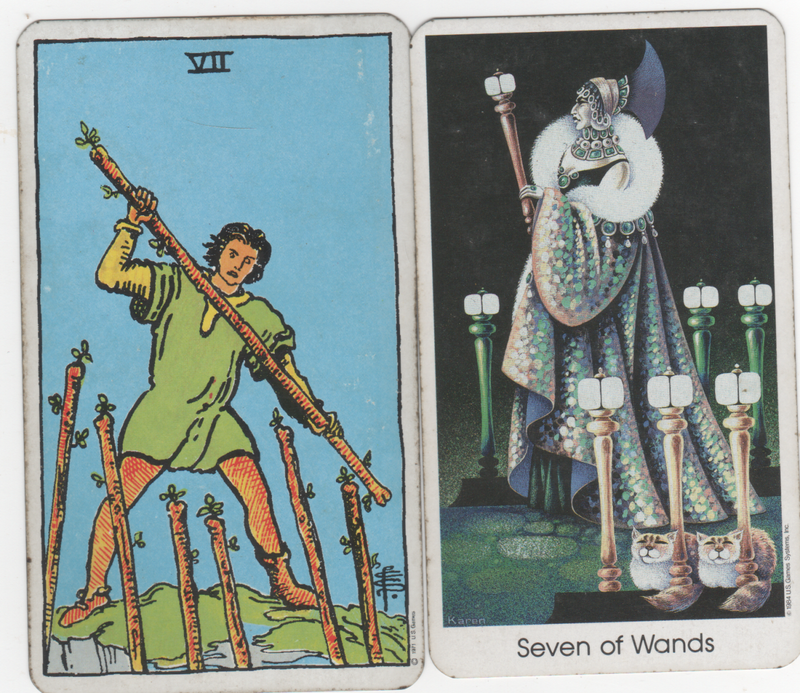 The meaning of the Seven of Wands can challenge your coping ability to emotionally persevere with moral integrity. This card can speak of spiritual inner battles. The test is to seek how we can pull from our inner reserves and hold faith to persevere. The Seven of Wands suggests that we use diplomacy and tact to get through a conflict (consider the sea of opinions). How can we effectively get our point across and respect the views of others? Is this asking you to face your inner battles, the ones that are not serving your divine spirit? Is there any inner “demon” holding you back from your Highest Self that must be faced with honesty? The Seven of Wands could be telling you that you are up against your own thoughts and emotional bondages that are imprisoning. Ask yourself if this really means for you to apply the energy of the Seven of Wands to your internal self. If this be the case you must consider initiating yourself in any potential conflicts. Ask yourself what issues can I just let go and do I always need to make my point in a situation and be right. What potential or current conflicts are really worth the time and energy? 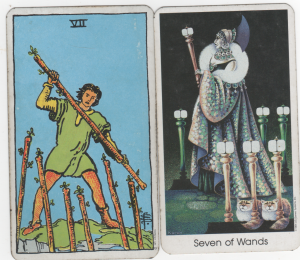 In each demeanor of the Seven of Wands (inner or outer opposition) you have a choice. All cards in the tarot present you with a choice. Tarot Card Meaning – The Seven of Wands – was written by Holly Marie Colino. If you would like to order a tarot reading click here.